Migrant Voice member Shirin is from Somalia and lived in Italy for a decade before settling in the UK. 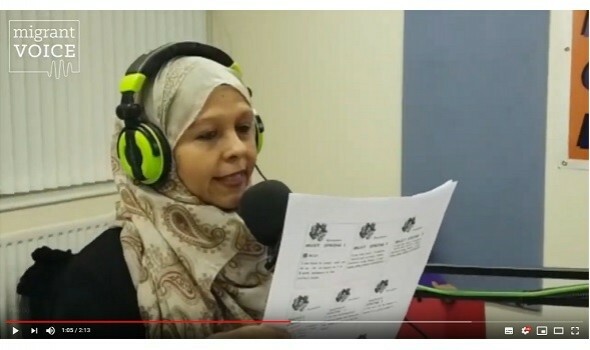 She had a dream to share her bilingual poems on broadcast radio but couldn't find a way of achieving this, until she attended a Migrant Voice MiFriendly Cities Media Lab session in Birmingham. There she met Vimal who invited her onto his V&Z radio show on Birmingham's Big City Radio. She performed her poems in Italian and English and took part in some live percussion performance too. Watch the video about Shirin and her radio appearance here.